It is usually our anticipation from any book that it will entertain us, take us on an exotic ride where varied emotions of life—surprise, love, desire, hatred, happiness, etc—can clash together and become alive through unheard anecdotes, tales, stories and songs. In short, we expect something different. This anticipation does not change even when we read a collection poems. 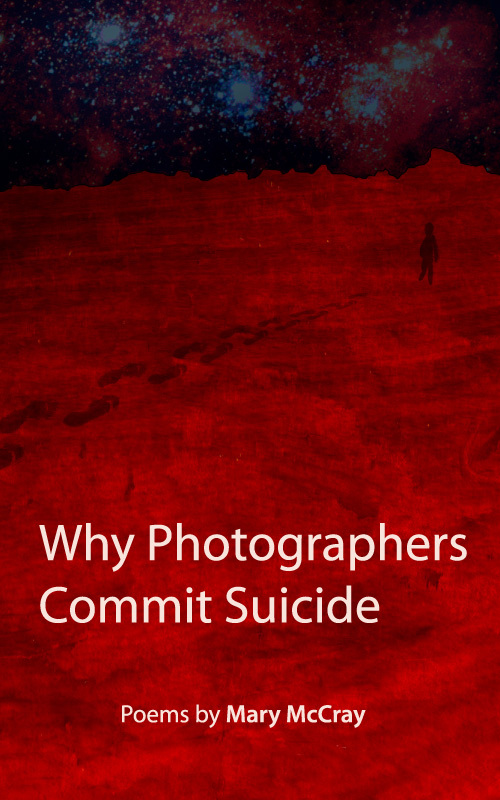 This weekend I found my postman delivering a book of poems ‘Why Photographers Commit Suicide’–a collection of science fiction poems by Mary McCray that explores the American idea of space exploration in distinct poetic style. And I anticipated it to be different. Before I lay my verdict, I would like to confess that I read science fiction poetry for the first time. Therefore, my anticipation of finding something different automatically starts from the genre itself. But it can merely entice me to get hold of a copy and not really plough through it till the end. From any poetry book, the foremost question is: is it exciting enough? Well it is exciting. In its opening poem, ‘Imagine Marts’, the collection prepares the readers to set out on an imaginary journey to Mars, supposed to have human habitation thousands of years from now. Thus it sets the tone. A number of instances have also been painted through the poems to record the imagined scheme of events in the space, especially on Mars. The collection is a reflection of the remotely-possible future on Mars where characters, objects and images are caught in Earth-inspired yet unusual dimensions. Several instances, recorded in verse, resemble day-to-day life on Earth and putting them in words so precise is certainly an achievement. Kudos to the poet In ‘Helga Traveling’, a woman is shown struggling to take her dog into the space “She filled the forms, passed tests, negotiated various options/of quarantine, wrote 36 letters to her representative/a 400-pound man repeatedly denied passage himself./She even tried to wrangle a working-dog visa.” In ‘The Torus City of Visceratonia’, a couple, settled on Mars, is urging, pleading possibly to a friend or relative of theirs to pay a visit them and tour Visceratonia—an imagined city on Mars. The lines “You’ll be bargaining for artifacts/drinking Martian Margaritas/And writing free verse.” also take the reader into the colonies of Mars. Having read halfway through the collection, suddenly I found myself surrounded by Martians, I ran through the sterile landscape, breathing ‘antiseptic air’, sitting on a ‘miscellaneous rock’, and drinking ‘Martian Margaritas’. It is an apparent attempt to envision future on Mars and in space. The poet seems as if exploring, discovering life on other planets, much like astronomers or space-travellers. She also finds poetry as a means to explore the mysteries of the universe. In Mary’s own words ‘Preface’, “…I hope one day all disciplines of thinking, all arts and sciences, will become reconciled to each other, that geologists and oceanographers will read poems to research the mysteries of land and sea, and that all poets will embark on voyages to locate sunken ships, to decipher the physics of music, to unearth the charms of a treasure map, or to explore space”. Overall the collection of poems is a good read, yet it lacks the power of lyric at some places and is not able to keep readers intact after a certain point because of the redundant and repetitive images. Once I was halfway through the overdose of Mars started getting on my nerves. The exotic journey evoked boredom and drudgery. But this does not weigh much on the actual strength of the poetry book. Or I should rather say these emotions are easily reined. In essence, I see the collection as a must-read because of the unique and distinct vision of the poet.